After looking at DB’s tree I see that he has a Selmer Nelson on his tree who is a known descendant of the couple Bard and Sigri Nelson(Nielsson) who make these two circles. So he clearly does belong and his tree just does not go back that far. 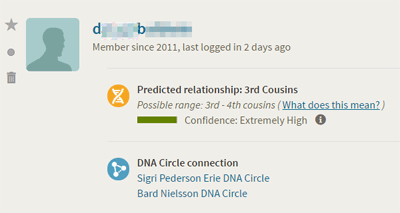 Using the shared matches tab on this match’s page, I find that this new match, DB is in common with yet another match in these two DNA circles, BK with whom he is more closely related; they both have Selmer Nelson as a grandfather. BK does not have a green leaf with my cousin JM because he has spelled Bard Nelson and Sigri differently. However BK is also a shared match with DK who DOES have a green leaf DNA ancestry hint with my cousin. DK shares Selmer’s dad J.B. Nelson with DB and BK. Aha, perhaps that is how this was figured out. Both BK and DK have Bard Nielson in their trees but DK spelled it the way we did. Now perhaps I understand how Ancestry put DB and BK in these circles! There are also many more people in this circle some of whom I had already found with those DNA match green leaves. I do love working with my perfect cousin’s DNA. She has no endogamy and such clear cut matches which make great examples. This is my third blog post using her data! Thank you so much JM for testing! I’m BK. Stands for BEAREKEN. Beare is my nickname and KEN are my initials. Keith Eugene Nelson. 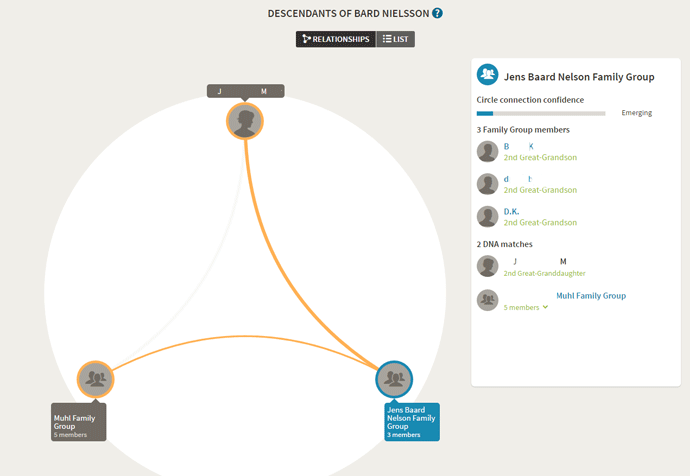 My dad was Selmer Nelson Jr. His dad was Selmer Sr. And through Jen’s Nelson to Bard/Baard and Sigri. And here I was trying to preserve your privacy! Lovely to meet you Beare. I found this circle with no hint thing fascinating! Just curious. I have a DNA circle for an Uncle. All the rest are Grandparents. Why would I have one for an Uncle? And most of my circles are based on great-grandparents or great-great grandparents. The idea is that it is a circle of people with whom you share DNA and your uncle would be one of those. Although the circle should be for his parents …. How can I look for DNA circles I am not related too. Stuck on tracing my surname past one man. If I can start looking at DNA circles for folk beyond tied to the line but at a greater distance in the past…hmmmm I have several circles in other lines to the 4th great but the one I am interested in only goes to the 2nd. You do not usually get circles for ancestors that are not in your tree. The case in this article was unusual and involved many many people with shared DNA from those common ancestors. You might get some new ancestor discoveries (NADs) for people not in your tree but these are often descendants of your actual ancestor. I have a match who does not have her DNA attached to a tree and there is no tree listed for her. Her match profile shows that she has four DNA circles in common with me! How does that happen? Ask ancestry. I would have to assume enough of her close relatives have trees for their algorithm to figure this out but I do not know that for sure.